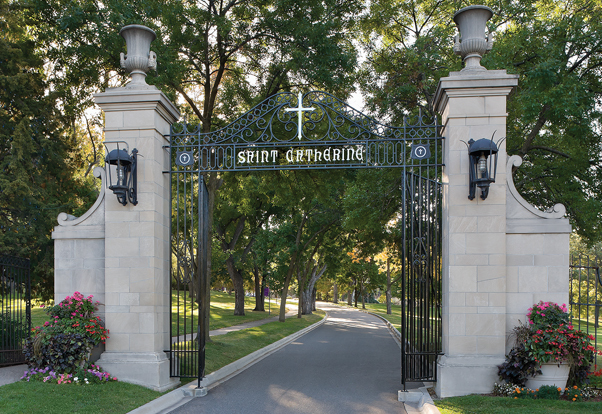 St. Catherine University, or St. Kate’s as it’s commonly known, was founded in 1905. Grounded in the liberal arts and the Catholic traditions of intellectual inquiry and social teaching, St. Kate’s educates women to lead and influence. St. Kate’s offers associate, bachelor and advanced degree programs in four schools: the School of Business and Professional Studies; the School of Humanities, Arts and Sciences; the Henrietta Schmoll School of Health; and the School of Social Work. With more than 60 programs of study, the College for Women is among the largest private women’s colleges in the nation. The University also offers a range of programs for women and men in the Graduate College and College for Adults. At every degree level, St. Kate’s serves a diverse student population; developing ethical, reflective and socially responsible leaders. St. Kate’s president is ReBecca Koenig Roloff, a 1976 graduate of the University. St. Catherine University educates students to lead and influence. St. Catherine integrates liberal arts and professional education within the Catholic tradition, emphasizing intellectual inquiry and social teaching, and challenging students to transformational leadership.